Free Shipping Included! 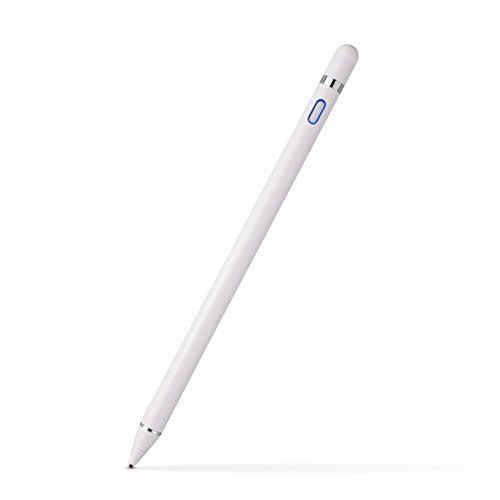 Zspeed Active Stylus Pen, 1.45mm High Precision and Sensitivity Point Capacitive Stylus, for most Touch Screen Device (White) by Zspeed at Got Busted Mobile. MPN: AC-020WT. Hurry! Limited time offer. Offer valid only while supplies last. 【Rechargeable & Stand-Alone】Built in lithium battery provides 10-12 hours of active use and recharges by Micro USB cable (included). Charging condition: 5V-1A. It will cut off power automaticly after 30 minutes of no use. Stand-Alone active stylus design. NO Bluetooth or APP required. 【Compatibility】Works with most capacitive touch screen devices, including iPhone X / 8 / 8 Plus / 7 / 7 Plus / 6s / 6s Plus, iPad Pro, iPad 9.7 (2017), iPad 1 / 2 / 3 / 4, iPad mini 1 / 2 / 3 / 4, Samsung Galaxy S7 / S7 Edge, Huawei, HTC, Google, LG and other touch screen tablets and smartphones. 【Precise/ Sensitivity】It has a 1.45mm super fine tip gives you the accuracy you need and provides superior control and traction against tablet screens. It is made of copper that will last for a lifetime. Active stylus technology reduces off set and lag time between fine tip and trace, keep your tablet or phone screen free of finger smudges by using this stylus instead. 【2-in-1 design】There is a magnetic closure cap on the stylus bottom, which can protect the usb port from damage and dirty; And we prepared two magnetic closure cap with fiber mesh tip and ribber tip for replacement. No worry when stylus out of power, just turn it upside down to continue your work with the sensitive fiber mesh tip or rubber tip. Or just in case you lost the cap but still have spare magnetic closure cap to use. 【Dimensions and Package】 Length:7.09"(180mm); Barrel Diameter:0.35"(8.9mm);Tip Diameter:1.45mm; Weight:16g ---Made from stainless copper and steel, no plastic parts, real pen feeling. Perfect for note taking and sketching apps. ※ Package: 1 stylus, 2 magnetic closure cap with tip, 1 pen bag, 1 micro USB charging cable, 1 User manual.